2. I am interested in a career in primatology. What resources are available? 3. Can you give me some general sources of information about the primates? 4. I know there is a lot of information available about the primates. Is there a central source for searching the literature? 5. How do apes differ from monkeys? 6. What is the difference between Old and New World monkeys? 7. How close are humans to apes genetically? 8. Can you give me some general information about gorillas? 9. Can you give me some general information about orangutans? 10. Where can I find information about Koko the gorilla? 11. Do you have a current estimate of the chimpanzee populations? 12. Are new primate species still being discovered? 13. Do primates make good pets? 14. If I have a primate as a pet - where can I go for help and information? 15. How do I find schools which have a strong program in primatology? 16. Where can I find information on monkeys trained to help people with disabilities? 17. Where can I look for primatological meeting and conference information? 18. Where can I find out which zoos or research centers have certain primates? 19. Who can I contact regarding the availability of primates for research? 20. I am looking for a colleague in the field of primatology. Where can I find his or her email or other contact info? 21. What causes wasting in marmosets? 22. How many non-human primates are used in research, and what kinds? 23. Do any primates have opposable thumbs? 24. What internet resources are available from the Wisconsin Regional Primate Research Center? Unlike traditional academic disciplines, primatology is characterized by the taxon of organisms studied, not by the kinds of questions addressed. Primatologists share an interest in non-human primates, but otherwise are a highly diverse group including scientists, educators, conservationists, medical researchers and veterinarians among others. Some focus exclusively on non-human primates; while others study primates as models for human diseases, or as part of complex ecosystems. While most people who identify themselves as primatologists have post-graduate training, they come from a wide variety of fields. A recent survey of the membership of the American Society of Primatologists found anthropology, psychology, biology/zoology and veterinary science as the most common disciplines of origin. Other represented fields include anatomy, biochemistry, genetics, medical science, pharmacology, and physiology. Research interests included primate behavior, biomedical and reproduction studies, ecology and conservation and animal husbandry. The Careers in Primatology web site provides many sources of information and advice for anyone interested in the field of primatology. There are also many videos and slides available through the Wisconsin Regional Primate Research Center's Audiovisual Resources. The Primate Literature Database, developed by the University of Washington Primate Information Center, includes journal, monographic and other citations pertinent to primatology from 1940 to date. You will need to obtain a password to access this database. "Apes differ from monkeys in several ways. Apes have no tail and generally have a larger body weight than most other primates. They have a more upright body posture and a broad chest.... Apes rely more on vision than on smell and have a short broad nose rather than a snout, as Old World monkeys do. Apes have a larger brain relative to the body size than other primates do...."
Rowe, Noel. The Pictorial Guide to the Primates. New York : Pogonias Press, 1996. P. 207. Old World generally refers to monkeys of Africa and Asia; New World, to monkeys of the Americas. In Old World monkeys, the nostrils face downward and are narrow. New World monkeys have round nostrils facing to the side. The dental formula of the larger New World monkeys includes 3 premolars. Old World monkeys have 2. Old World primates are diurnal and generally larger than their New World counterparts. Many of the Old World monkeys are partly terrestrial. Old World monkeys also have flattened nails on their digits, and most have pads (ischial callosities) on their buttocks. Rowe, Noel. The Pictorial Guide to the Primates. New York : Pogonias Press, 1996. P. 119. 7. How close are humans to the apes genetically? Humans differ from both common chimps and bonobos in about 1.6% of DNA, and share 98.4%. Gorillas differ somewhat more, by about 2.3%, from us and from both of the chimps. Humans differ from orangutans by 3.6% of DNA, and from gibbons and siamangs by 5%. Diamond, Jared. "The Third Chimpanzee," in The Great Ape Project. New York : St. Martin's Press, 1993. Pp. 94-95. The gorilla is the largest of living primates and a close relative of humans. Males have a height of up to 1.7 metres and weigh 140-180 kg. Females have a height of up to 1.5 metres and weigh 90 kg. Gorillas have a black to brownish-grey coat which turns grey with age. Older males have a broad silvery-white saddle on their coat, and the dominant male of a group is often referred to as the "silverback." Gorilla skin is jet black almost from birth. There are three races of gorilla found in two widely separated areas of Africa, these being the Western Lowland gorilla (Gorilla gorilla gorilla), the Eastern Lowland gorilla (G. g. graueri), and the mountain gorilla (G. g. berengei). The most endangered race is the mountain gorilla, which lives only in the Virunga Volcanoes region of Zaire, Uganda and Rwanda, and in the Bwindi Forest Reserve of Uganda. These two habitats were once continuous but are now separated by a barrier of cultivated land which the gorillas will not cross since they avoid open areas. The preferred habitat of the mountain gorilla is forest edge, regenerating forest, montane forest, riverine forest, and in certain seasons, bamboo forest. They also occur in lower numbers in primary forest. Mountain gorillas range in altitude from 1,650 - 3,790 metres. Gorillas are mainly ground dwelling animals. They walk on the soles of their hind limbs and the knuckles of their fore limbs. The mountain gorilla's diet consists of herbs, shrubs, vines and occasionally fruit. Gorillas never stay long enough at one feeding site to deplete their food source completely. They leave enough growth for rapid rejuvenation to occur. Mountain gorillas live in groups that usually include a single mature male, two to four adult females and two to five immature animals (less than eight years old). Lone males are the only individuals living outside these groups. Aggression in gorillas is extremely rare and serious fights occur only when a group leader meets another group leader. Females begin breeding at about 10 years of age, but males do not breed until they are at least 15 years. As a result of strong male-male competition, very few males have the opportunity to breed before 15-20 years of age. The gestation period is about 8.5 months, and usually only a single young is born. Offspring weigh 1.8-3.2 kg when first born, and their greyish-pink skin is sparsely covered with fur. They begin to crawl at about nine weeks and can walk from 30-40 weeks. Gorillas are weaned at 2.5-3 years of age. Females successfully produce offspring only once every four to eight years, since 40-60% of offspring die in their first year of life. No one knows exactly how long mountain gorillas live, but scientists estimate that they live to about 35 years in the wild. The Magnificent Gorilla : the Life History of a Great Ape / Don Cousins. -- Sussex, England : Book Guild, 1990. The Natural History of the Gorilla / A. F. Dixson ; with a foreword by R. D. Martin. -- London : Weidenfeld and Nicolson, 1981. Gorillas in the Mist / Dian Fossey. -- Boston, Mass. : Houghton Mifflin, 1983. Great Ape Societies / edited by William C. McGrew and Linda F. Marchant and Toshisada Nishida ; [foreword by Jane Goodall ; afterword by Junichiro Itani]. -- Cambridge ; New York, NY, USA : Cambridge University Press, 1996.
by Kara Lascola, Tufts University. Orangutan is Malaysian for "man of the forest". The orangutan is endangered due to deforestation and the spread of human populations into its habitat. Previously, the orangutan's habit covered all of Indonesia, Malaysia, Southeast Asia and parts of India and China. Unfortunately, today the orang can only be found in Borneo and Sumatra. In the wild the orang's lifespan is 35 years and in captivity it is 50 years. Orangutans are tropical rainforest animals. However, they can be found from sea level swamp forests to montane forests at altitudes of 2000 meters. Orangs are arboreal (tree dwelling) frugivores (fruit eaters). They live high in the trees, rarely comming to the ground. They are very unsocial animals. Females are found mainly with their young offspring and males are solitary and very territorial. Unfortunately, most of the orangs' habitat is disappearing. The estimated population of orangs is 20,000 individuals. Orangs are very difficult to study. They tend to be very fearful of humans and avoid contact when possible. This may be due to the extent to which orangutans have been hunted by man. While they are protected from hunting in some areas, they have been hunted to extinction elsewhere and are still hunted in some areas for medicine and sport or as pets or pests. Human beings are probably the only enemy the orang has. Due to their large body size and the fact that they live high in the trees, they are not exposed to predators on the ground. The defense orangs have taken against humans is avoidance. But while humans are the main threat to orangs, they also provide some defense for them. 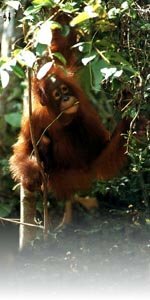 Certain indigenous populations on Borneo protect orangs from hunting, trade of orangutans has been made illegal and rehabilitation centers and protected reserves have been established. Adult male orangutans develop their large cheeks several years after reaching sexual maturity. It is most likely only the dominant adult males who develop these features. These large cheeks are called a secondary sexual characteristic of males. Among human males, the growth of a beard is an example of a secondary sexual characteristic. For adult male orangutans these large cheeks play a role in sexual attraction to females and in the production of the "long call", a very loud call used by adult males to mark their territory and communicate with other orangs. Orang-utans in Borneo / Gisela Kaplan and Lesley Rogers ; photography by Gisela Kaplan. -- Armidale, N.S.W. [Australia] : University of New England Press, c1994. The Neglected Ape / edited by Ronald D. Nadler ... [et al.]. -- New York : Plenum Press, 1996. Orangutan Species Survival Plan Husbandry Manual / Carol Sodaro, ed. -- [Chicago] : Chicago Zoological Park, . Orang utans : die Waldmenschen von Sumatra und Borneo / Konrad Wother [and] Carsten Clemens. -- Steinfurt [Germany] : Tecklenborg Verlag, c1996. There are a number of videos and books on Koko. The Wisconsin Regional Primate Research Center Library loans books for a four week period and videos for a two week period. Your local library may be able to borrow the items you can't find locally. Go to http://www.primate.wisc.edu/pin/avuse.html for more information about how to borrow these items. They produce a newsletter about Koko, titled Gorilla : Journal of the Gorilla Foundation. The following materials on Koko are held in the WRPRC Library. Koko's Kitten [videorecording] / produced by The Gorilla Foundation and Churchill Films. -- Los Angeles : Churchill Films, 1989. Koko's Story [videorecording] / produced by Denise Yamada -- [San Diego, Calif.] : KNSD-TV, 1990. Koko : a Talking Gorilla [videorecording] / a film by Barbet Schroeder. -- [Burbank, Calif.] : Warner Home Video, c1991. With Love from Koko / by Faith McNulty ; illustrated by Annie Cannon. -- New York, NY : Scholastic, c1990. The Education of Koko / Francine Patterson & Eugene Linden ; photographs by Ronald H. Cohn. -- 1st ed. -- New York : Holt, Rinehart, and Winston, c1981. Koko's Kitten / by Francine Patterson ; photographs by Ronald H. Cohn. -- New York : Scholastic, c1985. Koko's Story / by Francine Patterson ; photographs by Ronald H. Cohn. -- New York : Scholastic Inc., c1986. Early in the 20th century there may have been several million common chimpanzees. Current population estimates show that common chimpanzee numbers have dwindled to between 150,000 to 235,000 individuals, with most of the remaining animals found in the Central African forests of Zaire, Gabon, Congo, and Cameroon. The pygmy chimpanzee (Pan paniscus) has not been studied as heavily as the common chimpanzee and therefore population numbers are not as well known, but estimates have been made ranging from 15,000 to over 100,000. Source: Nowak, Ronald M. Walker's Primates of the World. 1999. Historically chimpanzees lived in the forests of Africa in an area that falls across 25 countries. Chimps have currently gone extinct in 4 of those 25 countries and the populations have been reduced significantly enough that they are in great danger of extinction in 5 more countries. There are only 10 countries that have populations over 1,000, and the common estimate is that there are less than 150,000 - 200,000 chimpanzees remaining in all of Africa. Source: Nola, Dora. PrimeApes. 4(1): 1-6, 1999. According to population estimates in Chris and Tilde Stuart's Africa's Vanishing Wildlife, there are under 17,000 western chimpanzees, over 80,000 central chimpanzees, and below 100,000 eastern chimpanzees in the wild, with perhaps another 3-5,000 in captivity. "Populations of the three chimpanzee subspecies are all in decline but the western chimpanzee is under the greatest threat and is considered to be endangered." The primary cause of the decrease in the number of chimpanzees is deforestation in Africa for logging and farming. It is estimated that the chimpanzee population will drop another 20% in the next 10 years. Source: Stuart, Chris and Tilde. Africa's Vanishing Wildlife. Washington, DC : Smithsonian Institution Press, 1996. pp. 64-67. Common chimpanzees (Pan troglodytes) are divided into three widely recognized subspecies: eastern (P. t. schweinfurthi) between Tanzania and Zaire, north and east of the Zaire River; central (P. t. troglodytes) between Zaire and Nigeria; and western (P. t. verus) between Nigeria (Togo) and Senegal. It has been estimated that there are approximately 8000 eastern chimpanzees outside of Zaire, of these about 5,000 are found in Uganda. Zaire may have over 5,000, but surveys are needed to get a solid estimate. Central chimpanzees are the most numerous, with perhaps 80,000 living mainly in Gabon and Congo. The western subspecies is patchily distributed and may number no more than 12,000. The bonobo (Pan paniscus) has a discontinuous range. They are found in the Central Zaire Basin of Equatorial Africa, south of the Zaire and east of the Lomami Rivers. Investigators estimate that fewer than 25,000 and more likely 10,000 to 20,000. Source: African Primates. Compiled by John F. Oates. 1996. Scientists in Brazil have discovered a new species of monkey, a squirrel-sized marmoset with plush orange fur and razor-sharp teeth that can tear the bark off trees. The discovery marks the sixth time in six years that researchers have identified a new primate species in Brazil, which is home to almost one-third of the world's 250 primates, the animal group that includes humans, monkeys, great apes, and lemurs. Marmosets and their close cousins, tamarins, are neotropical monkeys that live in the trees of South and Central America. They are generally small, the most extreme case being the pygmy marmoset, which at about 5 ounces is the world's tiniest monkey. Russell A. Mittermeier, president of Conservation International, a Washington-based ecology organization handling publicity for the new species said, "You'd think that the primates, our closest living relatives, which have been closely studied for decades, would be completely known by now. But they are not." The new marmosets are apparently not endangered and several are being studied in captivity, Mittermeier said. Scientists call it Callithrix saterei, but people in the Amazon jungle have given it a name that's as small and quick as the orange-haired marmoset itself: "zip." The newly identified monkey, no bigger than a squirrel, is the sixth primate species discovered by scientists in Brazil in the last six years. The first full scientific description of the creature appears in the current issue of the Brazilian journal Goeldiana. In general exotic animals are not recommended as pets. According to Advisory Memorandum No. 65 from the Centers for Disease Control and Prevention (CDC), non-human primates are NOT admissible into the U.S. as "pets." Once primates are in the USA their use as pets is governed by state and local jurisdictions--and these vary greatly. Some states require a permit for certain species of animals. If you decide to obtain a non-human primate to be kept as a pet, you should contact your State Veterinarian and state and local health and zoning officials. Sources of information on this topic include Primate Info Net, the web site of the Wisconsin Regional Primate Research Center. The page Primates as Pets includes comments from pet owners and well as other useful information for those considering keeping a primate as a pet. Also contact the Simian Society of America. Their web site can be found at http://www.simiansociety.org. They are an organization which offers advice and support for people who have primates as pets. The have produced a useful booklet for primate pet owners Primate Care (2nd edition), 1997. Contact Mel Orr, Secretary, Stephens Street, Dillsburg, PA 10719. If your local veterinarian deals with exotic animals as pets, this could be your first source to contact. The Simian Society -- a group of pet primate owners -- has published a spiral-bound book which you should find helpful, called Primate Care (Primate Care : a Handbook. -- Tucson, Ariz. : Simian Society of America, ). In addition to these two sources, our website, Primate Info Net (PIN), has a great deal of information about primate care and health concerns. There are also web sites which provide information about having primates as pets which you may want to look at. One is Monkey Maddness and the other is Heather's Wild World of Animals. Many colleges and universities in the US offer some courses in primatology. Very few if any, offer programs which lead to degrees specifically in primatology. People often take degrees in anthropology, psychology, zoology or veterinary medicine. People planning on careers in biomedical research will get Medical School related degrees. Remember that working with primates means you can be an animal care taker, a university professor, a zoo director, a field researcher, a curator of a primate house, the editor of a primate related newsletter, etc. There are many things you can do which involved working with primates. Keep in mind that this is a competitive field and that you will have to be well prepared. The Careers in Primatology web page contains links to resources related to educational opportunities in primatology. Among the things you will find is a Directory to Graduate Programs in Primatology--this lists selected programs and is updated annually by Judith Schrier, Editor of the Laboratory Primate Newsletter. Many urban zoos offer training and educational programs for young people. Be sure to contact your local zoo and ask about opportunities to learn about the primates. You should also consider looking at the International Directory of Primatology. This directory lists programs worldwide which offer educational programs. It is a comprehensive directory to the field of primatology and would give you a sense of the scope of activities which comprise the field. You can also use the directory search page to find out which programs involved chimpanzees, lemurs, etc. You may also want to look at Primate-Jobs. At this site you will see some current employment opportunities and listings (with credentials) of people who are seeking positions. In choosing a program, consider the resources in primatology which are available at that institution, the background of the faculty and the range of courses offered. If you want to compare undergraduate programs at a number of institutions which offer courses in primatology look again at Primate Info Net and search on syllabi--this will take you to the course syllabi for several college and university programs. Two professional societies, the International Primatological Society and the American Society of Primatologists both have education committees which may be able to provide additional suggestions. Contact: IPS (Sian Evans, Dumond Conservancy, Miami, E-mail: sevans@umiami.miami.edu) or ASP (Gabriele Lubach, Wisconsin Regional Primate Research Center, University of Wisconsin-Madison, E-mail: lubach@primate.wisc.edu). PIN has additional information on this subject, including a list of videotapes and a bibliograph of articles which appeared in newspapers and journals. The Primate Info Net Meetings Calendar lists national or international meetings, seminars, workshops, art exhibits or other events with a focus on primatology, and broader meetings which a substantive number of primatologists may attend. The International Species Information System (ISIS) provides an on-line list of species held at over 500 zoos worldwide. To find primate populations in research centers or other non-zoological programs, search the International Directory of Primatology. The Primate Supply Information Clearinghouse (PSIC) "provides communication between research institutions to facilitate exchanges of non-human primates or their tissues. Inquiries on availability of animals or tissues, and offers of available animals or tissues are accepted from any research institution or zoological park. The PSIC encourages placement and use of domestically-bred animals for research institutions. The goal of the PSIC is to increase sharing of these animals, thereby decreasing the need to import animals for research, and to ultimately decrease the number of animals needed." PSIC services are not available for "private pet owners, commercial breeders, dealers, brokers, importer-exporters, pet trade animal suppliers, exhibitors, or those using non-human primates for commercial or entertainment purposes". For information about primates used in research in the United States, look at the figures provided by APHIS. This question "... has no specific answer. Almost anything that upsets marmosets will result in wasting, unless you are very careful. Wasting is really a secondary consequence of : chronic or acute disease/infection of ALL kinds, gut upsets, too cool room temperatures, disturbance of colony due to construction/too many visitors/frequent loud noises nearby, inappropriate diet, "stress", and the list goes on. Wasting is a generalised heterogeneous end-state following any or a combination of the above insults. The best thing to do is to focus on the actual cause of your problem and not to just try and treat the wasting as there is no single treatment for wasting: it is caused by too many things. A good author to search for regarding so-called marmoset wasting syndrome is C.M. Hawkey between 1980-1996. Chris showed that wasting is not an actual syndrome, its just the end result of a multitude of different initial pathologies." According to the USDA's 1997 Animal Welfare Enforcement Report, 56,881 primates were used in research, experiments, testing and teaching during the years 1995-1997. In a December 8, 1999 article in "USA Today," this number was reported by the USDA as 57,377 primates. Breakdown by the particular species used in research is not available. "A movement by which the pulp surface of the thumb is placed squarely in contact with - or diametrically opposite to - the terminal pads of one or all of the remaining digits" While an opposable thumb is one of the hallmarks of humans, it is not unique to the species. What is unique to Homo sapiens sapiens is the broad area of the contact achieved between the compressible pulps of the index finger and thumb. Not all primates are capable of opposing their thumbs. The necessary movement for true opposability is the rotation of the about its own long axis. Without this rotation the movement of the thumb towards the palm is a form of pseudo-opposability where pulp-to-pulp contact of the thumb and digits is not possible. Source: Napier and Napier. The Natural History of the Primates. MIT Press, 1985. Source: Ankel-Simons, Friderun. Primate Anatomy. Academic Press, 2000. The WRPRC Library and Information Service has many resources available for people interested in the field of primatology, including books, periodicals, and audiovisual materials. In addition, Primate Info Net provides access to a number of internet resources maintained by the WRPRC. FOCUS: A professionally oriented electronic discussion forum for people involved in research using nonhuman primates. FOCUS: An archival collection of primate related videotapes slides and audiotapes which may be borrowed for research or educational purposes. FOCUS: A directory to the field of primatology, includes detailed information about organizations, people, species held, educational programs, primates in zoos, information resources. FOCUS: An information resource for primatologists, includes a taxonomy, endangered primates listings, the P-T Directory, newsletters, veterinary resources, etc. Documents can be viewed and downloaded locally. FOCUS: An internet reference service available to the public. FOCUS: An internet job listing service. Includes positions available and wanted. FOCUS: A resource providing information about educational and employment opportunities in primatology.